Homiles LXVI and LXVII, Vol. X, NPNF, St John Chrysostom, c. 400. "Concerning Faith & Good Works," Martin Luther, c. 1521. Calvin's Commentary, The Harmony of the Gospels, Vol. XVII. "Palm Powered Protest," Adam Copeland, ON Scripture, Odyssey Networks, 2014. Video: What Would You March For? "Ride On, Ride On," Nancy Rockwell, The Bite in the Apple, 2014. "Tell the Story," Andrew Prior, One Man's Web, 2014. "Jesus, a Donkey, and Jon Stewart's Rally for Sanity," Carl Gregg, Patheos, 2011. "Wave your flag, but DON'T Touch the Treasury!" Peter Woods, I Am Listening, 2011. "Be they political supporters, pop idol followers, or sports fans; crowds are at their best when they are cheering on a winner." Lectionary Blogging, Palm Sunday, John Petty, Progressive Involvement, 2011. This'll bring the crowds out, Neil Chappell, aweirdthing, 2011. Holy Textures, Understanding the Bible in its own time and in ours, Matthew 21:1-11, David Ewart, 2011. "Now Jerusalem is not a large city. And what the authors of the Bible take for granted and fail to mention is that while Jesus is parading in on a donkey through one of the back gates, on the other side of the city Pilate is parading in on a war horse accompanied by a squadron or two of battle-hardened Roman soldiers. Do you think anyone at Pilate's parade heard about Jesus' parade? Heard what the crowd had shouted? Let's see what unfolds in the week ahead." Dylan's Lectionary Blog, Palm Sunday, 2005. Biblical Scholar Sarah Dylan Breuer looks at readings for the coming Sunday in the lectionary of the Episcopal Church. "Jesus didn't come to take over Pilate's system; he came to replace it. When we confess that Jesus is Lord and Christ, the anointed king, we are leaving no room for the Pilates of this world." "First Thoughts on Year A Gospel Passages in the Lectionary: Palm Sunday," William Loader, Murdoch University, Uniting Church in Australia. "Thus Jesus' approach to Jerusalem has become for many a symbol of the confrontation they must make, including the confrontation with themselves." A Prayer for the Journeyers, William Loader. "First Sunday in Advent: Matthew 24:37-44 or Matthew 21:1-11," The Matthean Advent Gospels, James Arne Nestingen, Word & World: Theology for Christian Ministry, Luther Northwestern Theological School, 1992. (Section on this text begins on page 408). "Forgiveness of sin is not merely therapeutic accommodation to the inevitable disappointments of a selfhood running out of control, it is the current form of the resurrection, opening both self and community tot he freedom of life lived beyond condemnation, in grace." "The Triumphal Entry," Rev. Bryan Findlayson, Lectionary Bible Studies and Sermons, Pumpkin Cottage Ministry Resources. Includes detailed textual notes. Bassler, Jouette M., "A Man for All Seasons: David in Rabbinic and New Testament Literature," Interpretation, 1986. Frenz, Albrecht, "Matthew 21:5-7," Novum Testamentum, 1971. Instone-Brewer, David, "The Two Asses of Zechariah 9:9 in Matthew 21," Tyndale Bulletin, 2003. Meyer, Paul W., "Matthew 21:1-11, Expository Article," Interpretation, 1986. Nestingen, James Arne, "The Matthean Advent Gospels," Word & World, 1992. (Section on this text begins on page 408). Verseput, Donald J., "Jesus' Pilgrimage to Jerusalem and Encounter in the Temple: A Geographical Motif in Matthew's Gospel," Novum Testamentum, 1994. Palm Sunday 9 April 2006, James Mueller, Göttinger Predigten im Internet: Every Sunday Sermons based on the RCL by a team of Lutheran theologians/ pastors. "A Beautiful Mind," the Rev. Dr. Joanna Adams, Day 1, 2005. "The Right Words" - Palm Sunday - 20 March 2005, Luke Bouman, Göttinger Predigten im Internet: Every Sunday Sermons based on the RCL by a team of Lutheran theologians/ pastors. "Who Is This?" the Rev. Barbara K. Lundblad, Day 1, 2002. "What Are You Doing for Lazarus?" Pastor Edward F. Markquart, Grace Lutheran Church, Seattle, Washington. "The Quintessential Pilgrim," the Rev. Dr. Hugh L. Eichelberger, Day 1, 1996. "Storypath Lectionary Links: Connecting Children's Literature with our Faith Story," April, 13, 2014, Union Presbyterian Seminary. Connections: Psalm 118:1-2, 19-29 and Brother Sun, Sister Moon reimagined by Katherine Paterson, Matthew 21:1-11 and Xander's Panda Party by Linda Sue Park. 2011. "Pokey the Little Burro," Jim Kerlin, Children Sermons. Rock Star Jesus, Anna Shirey, Anna's Hosannas, Children's Lesson for Palm Sunday, 2011. 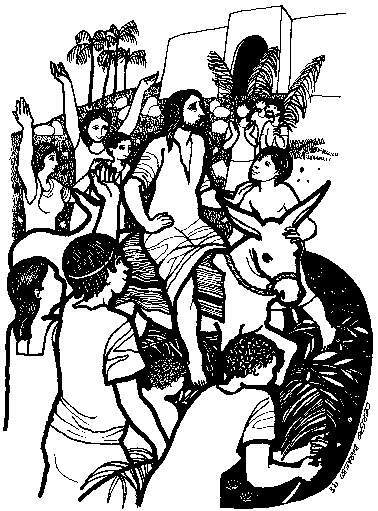 "The Children Welcome Jesus - Palm Sunday," Illustrating the Story (lessons, children's sermons), coloring pages, activity sheets, crafts, children's songs. MSSS Crafts. "From Cheers to Jeers," and "The King Is Coming," Charles Kirkpatrick, Sermons4kids.com. "The Triumphal Entry into Jerusalem," children's study, puzzles, coloring sheet, etc. Higher Praise Christian Center. "Palm Sunday," Reader's Theater, Lisa Ann Moss Degrenia, 2012. Clip Art, Matthew 21:8, 9, Fr. Richard Lonsdale, Resources for Catholic Educators. Palm Sunday, Lectionary Clipart, Hermanoleon Clipart. Matthew 21:1-11, at Cerezo Barredo's weekly gospel illustration. Liberation emphasis. The Triumphal Entry, Henry Martin, sermons4kids.com. "He Stood Before the City," F. Richard Garland, tune: BLAIRGOWRIE by Ralph Harlow, United Methodist Church GBOD. Hymns with Scripture Allusions: Matthew 21:9. The Cyber Hymnal. "All Glory, Laud and Honor"
"Daughter of Zion, Look up: See Your King!" Brenton Prigge, NewHymn, a new, relevant hymn set to traditional tunes.